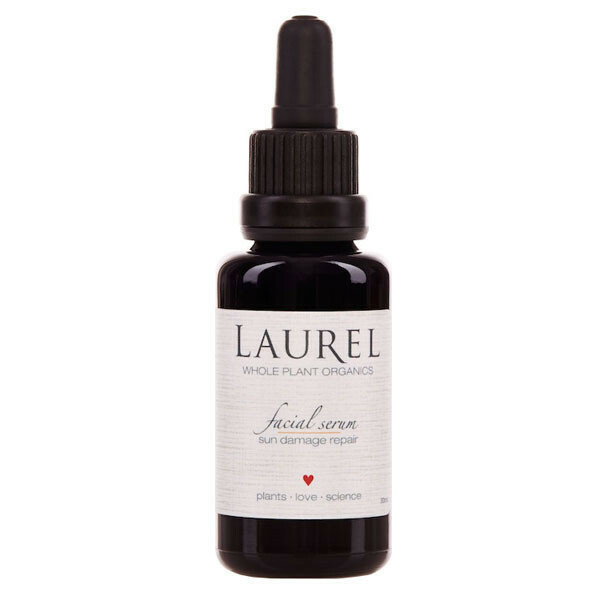 The Sun Damage Repair Facial Serum from Laurel Whole Plant Organics is loaded with plant based ingredients that make skin look repaired and youthful with a bright appearance. This concentrated elixir is made by hand in ultra-small batches and features a luxurious cocktail of raw, organic, locally sourced ingredients including rosehip, red clover, bilberry, cranberry, red raspberry seed oils, and Laurel’s own biodynamic 'house blend'. A little of this Laurel facial serum goes a long way in offering a repaired and brightened look to skin. Use just a few drops every day to gain visible results. Formulated to be non-greasy, this ultra-pure super-powered serum addresses signs of damage caused by the sun and other environmental stressors. You'll be rewarded with a brightened, lightened, and smoother appearance by applying this Hero regularly. Apply day and night regularly for optimal results. Squeeze 3-5 drops of serum into palm then dip fingers into the 'pool' and gently tap serum over cleansed and still moist face. Gently massage onto skin with both hands. Add a couple of drops to the neck and chest area if desired. I've been using facial oils for almost 20 years, back when there were like 2 to choose from. I'm glad I get to live in a world where something like this sun damage oil exsists. It's just beautiful in every way. It sinks into my skin and is perfect for day and night. It smells beautiful (exactly like intelligent nutrients immune oil from years ago, not sure that's still around), it has wonderful healing and protective ingredients, and keeps me perfectly hydrated and dewy without being too shiny. I have dry but acne prone and easily congested skin, and my face just loves this oil. I can't say enough good things about it. I'm not new to "green" beauty, have been practicing such since I was a kid, and I make a lot of my own concoctions of things. That said, I love this and can't see not having it or being without it. I'm also not a sunscreen wearer, I just believe in covering up and staying out of the sun, and the fact that this offers some barrier and protection from the sun just takes the cake on how much I love this stuff. Wonderful product from a seriously advanced company! The few things I've tried from Laurel have me hooked, and that's not easy to do!